Wedding of John Laughlin Logue b. 1902 d. 1981 and Dorothy Marion Underwood. 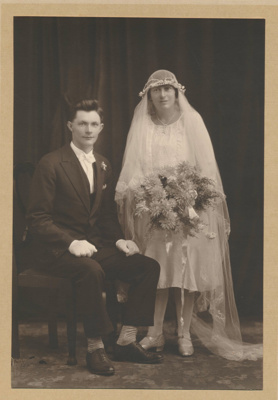 John's grandparents, James and Catherine Logue, were an Irish couple from County Tyrone. They came to Mangawhai c. 1860. Later, they moved to Te Arai. John's parents were Hugh Patrick Logue b. 1870 d. 1945 and Martha (nee Yates) b. 1872 d. 1963.